I don’t really know what I was expecting from a Richard Adams book. Adams’s reputation for gory gut wrenches featuring four legged protagonists is inescapable. In an alternate universe, this might even be a review of Adams’s similar story, Watership Down. There are clear parallels between the two novels: both feature animal protagonists; both are very dark; and one of the main characters from Plague Dogs, Snitter, shares similar brain damage symptoms to the character, Fiver, from Watership Down. A novel being narrated from the point of view of an animal is nothing new; however, I initially found it jarring to read a novel told from the point of view of two dogs. Suffice to say, I got over this hang-up sooner than expected and, in fact, grew to like it. There’s a line towards the beginning of the novel in which one of the two canine protagonists talks about a “Whitecoat making the gesture to create light”. Obviously, this is a person in a white lab coat using their hand to turn on a light switch, but from a dog’s point of view, magic is being performed. Adams’s treatment of moments such as this is touching without being cliched or cutesy. Crucially, it provided the reassurance I had hoped for that my time would be well spent and no doubt about it, he’s an expert storyteller who writes with skill and style, and his chosen point of view – the two dogs – appeared pretty quickly for what it is: a master stroke. I’m not a particularly sentimental person but even I grew to care about and root for the book’s canine heroes, Rowf & Snitter. These are two dogs used for – frankly – inhumane experiments, and who make a miraculous escape in an attempt to hide from those who would seek to return them to captivity. Along the way they are helped by Tod, a fox with a thick Scottish accent (how cool is that!) and they encounter a naturalist, Sir Peter Markham Scott, who helps the justifiably jaded Rowf to understand that not all humans are bad. But this is no mushy sentimental book – by any stretch of the imagination. Those familiar with Adams’s work will understand that it is bleak and painful and tragic: an emotional runaway train ride. Brace yourself for an ending which is nothing short of shocking. But that’s a good thing because it reveals Adams’s supreme skill in reaching us to the point that we truly care about these characters. Although I shed no tears, I have spoken to people who have said that they were physically unable to read the ending, and others who did said that they could never read the book again. Part of the reason everything hits so hard in Plague Dogs is because the world we are invited to inhabit feels so real. Not an easy feat when the main characters are talking dogs. Adams’s writing style is graceful yet packs a mighty punch; it’s dark but somehow dazzles. 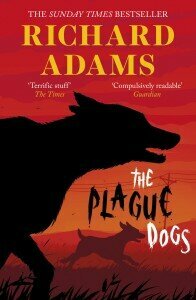 If I can’t give Plague Dogs a resounding ovation, it is simply because it’s not the genre of book I normally go for. That said, I know a good book when I read one.